I heard a bold and also quite debatable statement recently and at the farmer's market of all places. And it challenged me. Now those of us who have livestock even the the dairy type, are naturally going to think their animals are the best on the earth. Of course we all do, we believe in what we are raising and doing. We are passionate about that and so it just comes out as we sing the praises of our herds and flocks. But what I heard wasn't just praise, it felt like a very misunderstood concept. Now I'm not going to say anything about who this person was or what all was said but the gist of it was, goat milk is higher in fat than most milks including sheep and so the products made with goats milk would also then be higher in fat. And it was said to me. Now everyone who knows me well, knows I have both sheep and goats. And that I milk them both daily. Now I most definitely don't know everything but I do have some book knowledge about the 2 and their differences and maybe even more importantly, I also have it hands on. I do make a variety of cheeses and drink both milks on a daily basis. And at all different times. For instance, straight from the udder, a few days in the fridge and 2 weeks in the fridge and all times in between. Milk changes. As we all know, milk will not taste the same a couple of months later in the fridge as it did the day we put it in the there. Lots of variables in milk and many factors and the milk changes. Feed, where in lactation the girl in milk is at - beginning, middle or near the end. So many things to consider when talking about milk. And that's not even getting into the taste or the solids. About the butterfat, I do know it varies between the breeds of goats and my breed of goats are on the lower end of the butterfat list. But without a fancy chemistry test I also know first hand that a larger quantity of milk a lactating animal produces, the lower the fat in that milk. 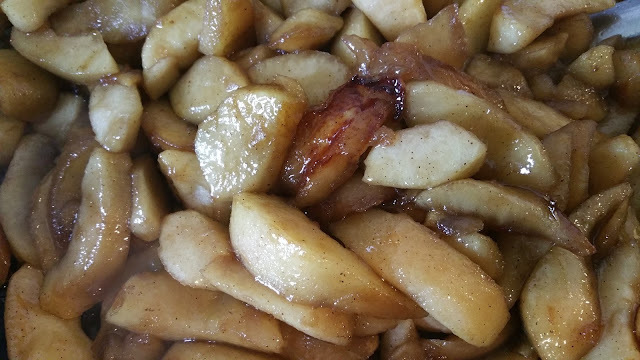 And most often the smaller the quantity, the higher the fat. In general, sheep produce less milk than a goat and definitely a cow. Lambs grow at a high rate of speed, if y'all follow our farm on Facebook during lambing season, y'all also watch first hand how rapidly the lambs grow in such a short amount of time. That my friends, is butterfat. Most sheep generally lactate a smaller quantity of milk and so the the nutrition is naturally in concentrate form to keep up with the lambs. Many lambs are ready for weaning at just about a month of age. If they go on nursing past this point, you will find lambs to continue growing rapidly. By the time our lambs are 3-4 months of age, if they're still drinking their mother's milk, the lambs are nearly full grown. That kind of growth takes an incredible amount of nutrition and fat. Our goats in no way can keep up with that level of growth. Which does not mean I don't love my goats and think they're the best goats in the world..because of course I do! But I also know that sheep milk speaks for itself and someone can make as many claims as they'd like but the facts look me in the face each and every day and that simply can't be argued with. All milk rocks but sheep milk, it hits the over the fence, home run. This morn I whipped up a batch of sheep milk butter for a pan of friend apples. Here's my butter tutorial and this time I'm starting from the finish line to the beginning so scroll on down to the bottom and work your way up. Cheers to fresh milk folks! When the butter begins to melt, that's my favorite part! 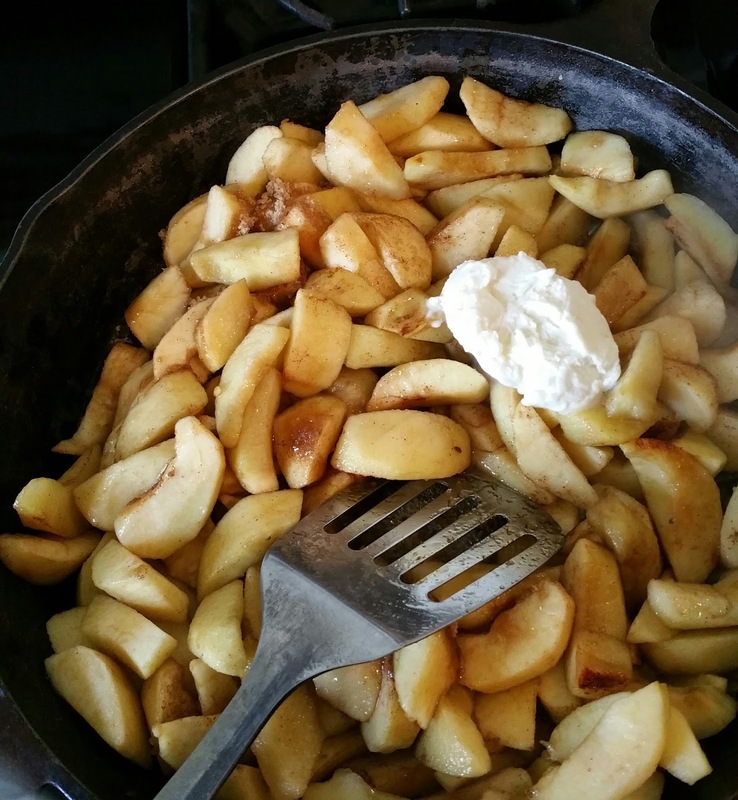 Adding the butter to my skillet of apples. 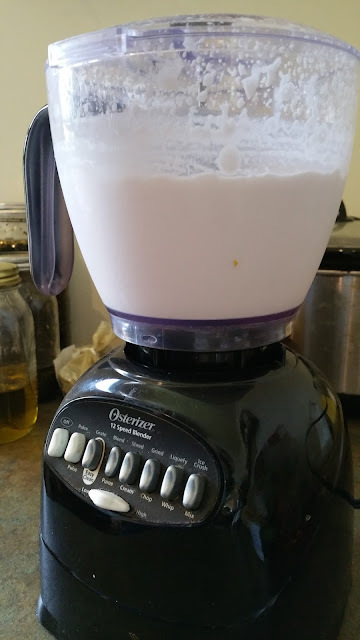 From less than a half gallon of sheep milk, I got almost a 1/2 cup of butter and a full cup of buttermilk and I still left a little cream in my milk. 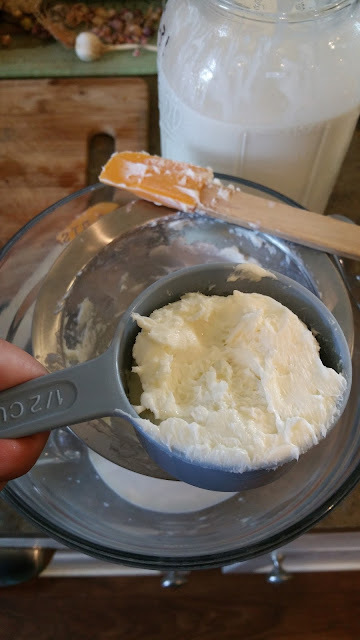 If I wasn't planning to be using the butter right away, I would rinse the butter in ice cold water as I squeezed out as much liquid as I could from the butter with my spatula. I would do so several times. 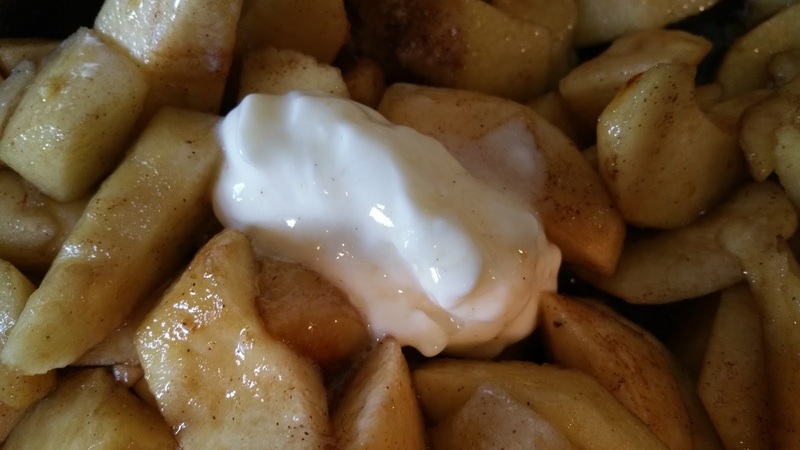 It chills the butter quickly and removing as much liquid from the butter will preserve it longer in the refrigerator. But if I plan to use the butter immediately, I skip that step. The buttermilk and remaining butter will be going into tonight's cornbread supper and the milk goes back into the fridge - still tasty, it just lost a little fat. I set a strainer on top of a pyrex measuring cup and pour the entire mixer's contents into a strainer. 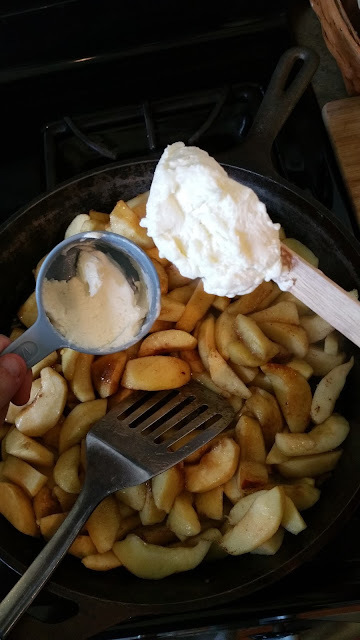 The butter milk runs through the strainer into the pyrex as I take a small spatula and squeeze out the excess milk out of the butter which really creams it up. 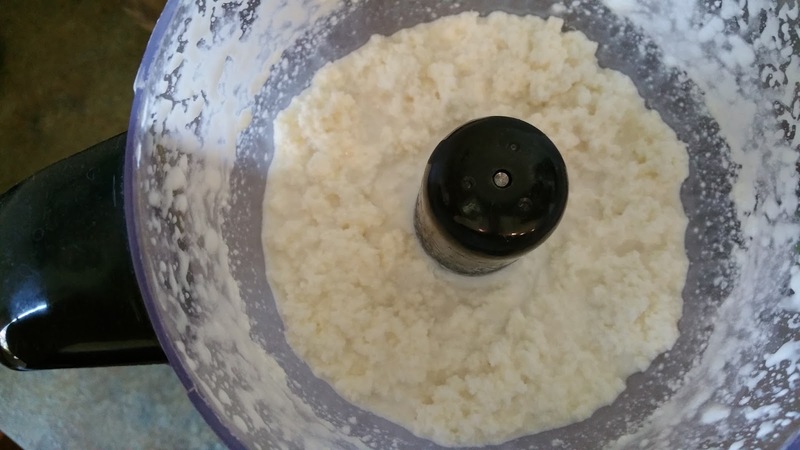 Once I see plainly the butter and milk separation which almost resembles cottage cheese, we're ready for the next step. You can see here the milk is now thick and taking form, we're almost done. 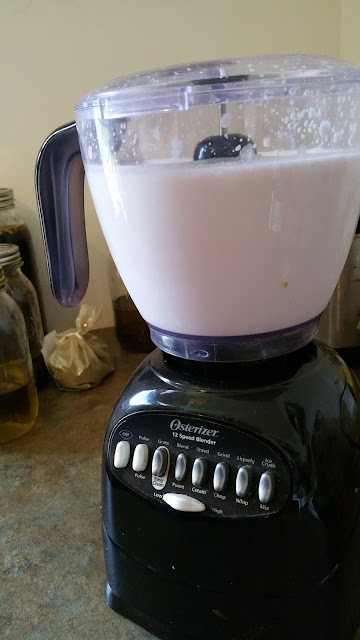 As it mixes and blends, you will see the milk changing. 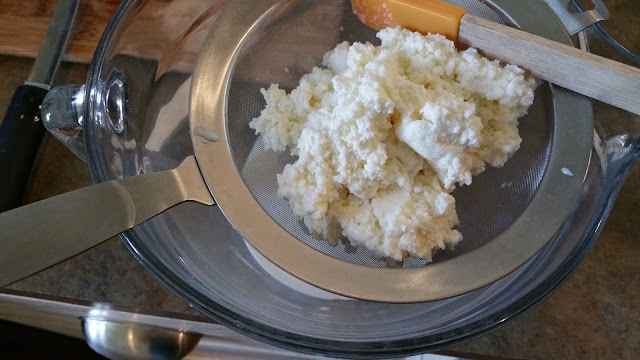 The butter is beginning to separate. 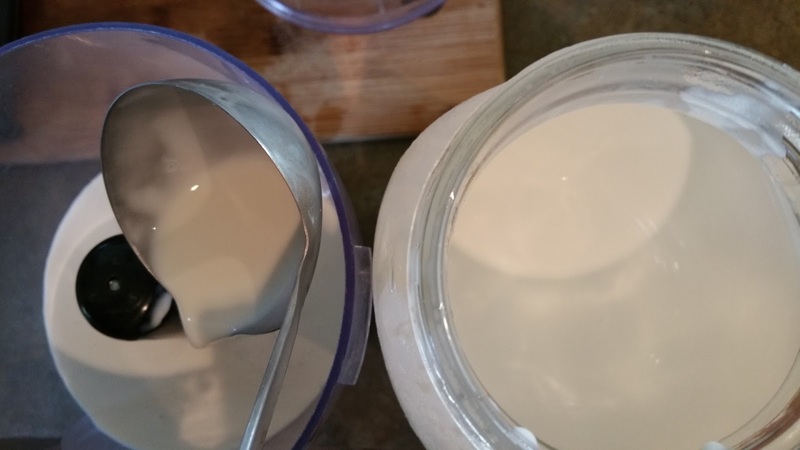 Once you scoop as much cream off the top of the milk as you can, begin mixing it on a regular blend setting. 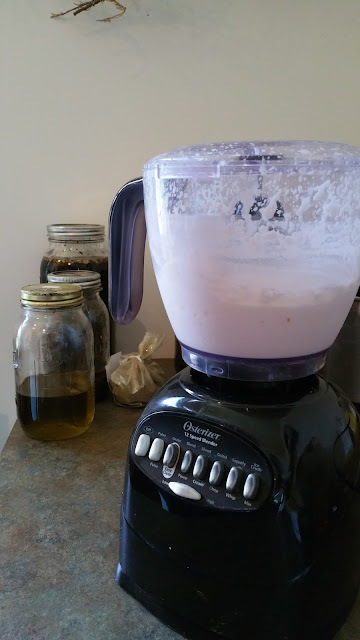 I prefer using older milk that has been sitting in the refrigerator for awhile, which allows the cream to collect at the top of the container. 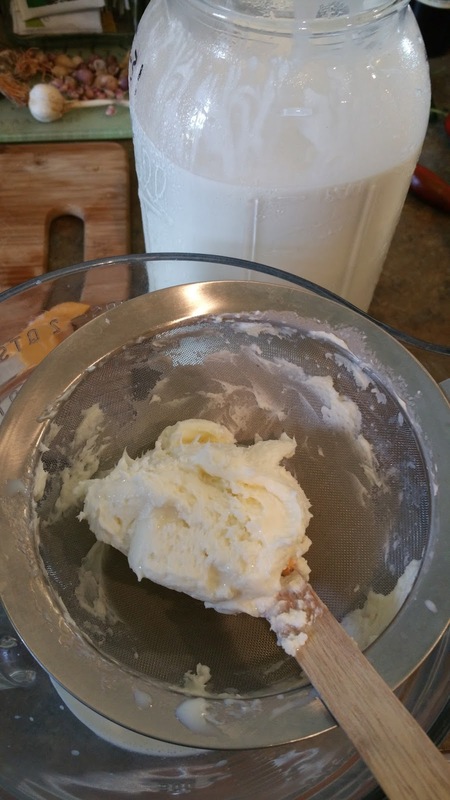 And it needs to not be homogenized so there is a cream layer at the top, this is why fresh milk is important. If you don't have access to fresh milk you can also just easily use regular pasteurized heavy cream from the store. But regular pasteurized/homogenized milk from the store will not do because the cream has already been removed. The milk I used here was 10 days old, perfect for me. Ladling the cream off the top and into a mini processor. A blender works beautifully too, I just don't have own one. So a mini processor it is.